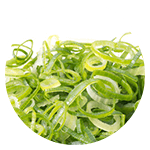 These days, ramen has become widely accepted as a form of cuisine all over the world, having long been popular in many different areas. Ramen originally began in China, but its development really flourished in Japan. It’s a special kind of fast food, and it holds a special place in people’s hearts for the seemingly endless amount of varieties that exist to discover — as well as how satisfying it is to eat . The ramen eaten in Kyoto, too, is said to be of a particularly high quality, even when compared to ramen throughout the rest of Japan. Why is this? There are a couple of reasons that are commonly suggested — let’s take a look at a few below. Firstly, Kyoto has long been a “student town.” Around ten percent of the population of the city is made up of students, among whom ramen — which is at once cheap, tasty, and filling — has a huge following, even compared with other popular fast foods . The extraordinarily high level of Kyoto’s culinary culture (stemming from the city’s historical and cultural background) also no doubt has an influence on the quality of the dish. Besides this, other suggested reasons include the fact that Kyoto has a great number of long-running and well-established ramen shops, the fact that Kyoto loves new things while still placing importance on the old, and the city’s surprising love of boldly-flavored foods. 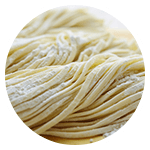 There is an innumerable variety of noodles in existence: thick “futo-men” noodles that mix in well with soup, thin and easily-slurped “hoso-men” noodles, and curly “chijire-men” noodles, which are used in the soupless ramen dish, “tsuke-men.” In Kyoto, many ramen shops use their own homemade noodles, or select the noodles that go best with their own soup from noodle factories. Indispensable as a topping for ramen. 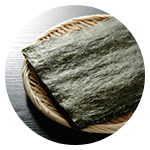 Many shops use the large and crunchy “kujou-negi” variety, which comes from Kyoto. 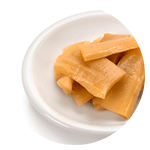 Menma is a flavored processed food made of fermented bamboo shoot. Boiled eggs, marinated in a soy-based sauce. 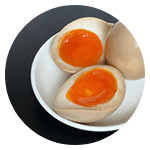 Every ramen restaurant tailors their eggs to go well with their ramen — the eggs vary from hard-boiled varieties to ones with the yolk is still runny. 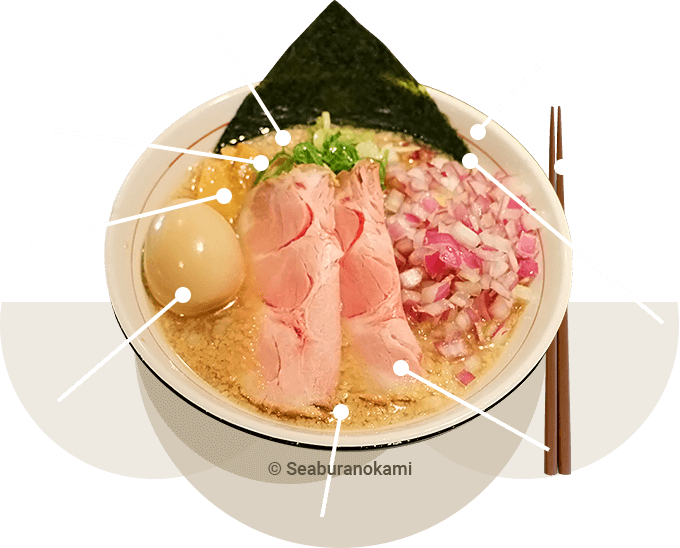 Eggs are not always served as toppings for ramen right from the get-go, so if you’re an egg lover, remember to tell the staff you want a nitamago egg with your ramen! 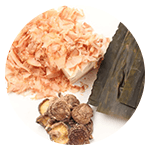 There is a great variety of soups out there, including “Tonkotsu” (a soup made by boiling pork bones over a long period of time), “Shoyu” and “Miso” (soups made by adding soy sauce or miso to chicken stock), and thick soups made only with vegetables. In recent years, a number of entirely new kinds of soup have emerged, such as “Paitan” (a milky and thick broth made from pulverized chicken bones stewed over high heat) and “Bushikei” (a ramen combining seafood and animal-based stock). 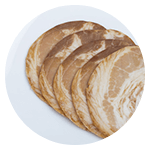 Slices of roast pork, with a flavor that’s been left to soak in for many hours. Many different kinds exist, from rare char siu to varieties that have been cooked until they’re browned. Now, in 2016, chicken char siu is undergoing a bit of a boom in popularity. Nori brings together the design of ramen as a whole. Dip it into your soup and eat it whenever you feel the time is right! 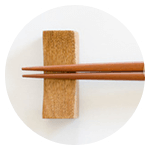 Use your chopsticks to eat your noodles and the other ingredients, and your spoon for the soup — that’s the basic rule. 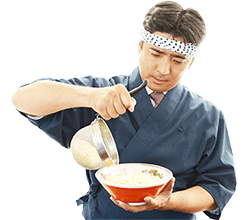 But feel free to eat your ramen however you want if it makes it tastier for you… so long as you don’t bother anyone around you, that is! 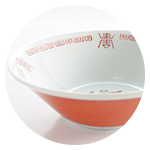 This both the bowl ramen is served in, and an integral part of the dish known as ramen itself. It is even said that the flavor of a bowl of ramen changes depending on the shape of the donburi. Different shops use all sorts of bowls, so it’s fun to appreciate the different varieties. Once you’ve finished your ramen, raise your donburi to your lips and down the rest of the soup — now you’re a real ramen aficionado! 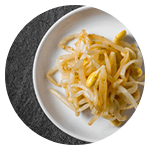 Some shops place small dishes of flavored bean sprouts and kimchi on their tables for you to enjoy at your leisure. Many also have containers of black pepper, Japanese pepper, shichimi (a blend of seven spices), or lemon seasoning on the tables so you can have fun changing up the flavors of your meal while you eat. Feel free to enjoy your ramen as you wish (but remember your manners)! Ramen is more than just noodles in a bowl full of soup. 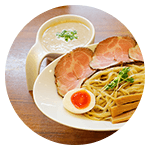 There are also a wide range of other varieties, such as “Tsukemen,” in which the noodles and soup are served separately, and “Mazesoba,” in which the noodles are placed on a small quantity of richly flavored sauce, and heartily mixed together.